Renewable Developments Wales works with landowners to develop, consent and finance solar power generation projects in Wales. 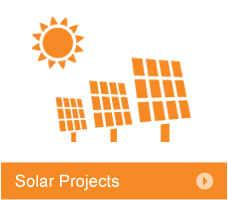 These are mainly medium to large scale solar projects. If you would like further information or are interested in a solar power project on your land, please contact us for more details. Electricity generated from solar panels is a low carbon source of energy that will help Wales achieve its target of doubling its renewable energy generation by 2020. The UK as a whole has binding targets of meeting 15% of its energy needs from renewables by 2020, and to achieve this it will be necessary for the UK to change its energy mix, reducing reliance on high carbon energy sources such as coal, oil and gas and increasingly replacing them with renewable forms of energy such as wind, solar and tidal. Solar power is a tried and tested technology that produces a consistent and predictable source of sustainable energy. Electricity generation from coal emits 0.89 tonnes of CO2 per MWh and from gas emits 0.37 tonnes of CO2 per MWh. The production of solar energy does not lead to any carbon emissions. Therefore, a year’s solar generation from a 10MW solar farm would lead to a saving of up to approximately 8,900 tonnes, or 222,500 tonnes over the life of the solar farm.